Camping season is still upon us, and as previously stated, camping trips have become some of my favorite memories. Though, let’s set our priorities right and get down to the best part of camping: the food! We know no camping meal is complete without the usual grilled hot dogs and burgers – they’re inexpensive, come in packs and are easy to make. But sometimes we want to be adventurous – that’s the whole point of camping! From the most important meal of the day to the delectable delight of desserts, there are many different meals to shake up your camp-ready taste buds. Gather your basic ingredients, pack them in a portable cooler and hit the road! It’s time to try out some new recipes and chow down around the campfire. The chirps of birds ring across the morning sky as the sun rises and emits light on to your campsite. The only thing you hear are the zips of tents opening and footsteps under branches. Good morning! Take a deep breath of fresh air – it’s time for breakfast. One of the first recipes that come to mind is an easy-to-create breakfast hash. Not only are hashes simply wonderful, their recipes only require one pan so it’s a great option for when you need to pack light. Get the fire started and take your pan (I recommend cast-iron) and place it over the campfire. Cook bacon to desired crispiness then set aside. Let it cool slightly then crumble. Add hash browns and cook until it begins to brown. Season with salt and pepper. Stir the crumbled bacon into the skillet and push hash to one side. Crack your eggs into the skillet then season and cook until desired. Combine eggs and bacon hash and serve! Cowboy coffee, as it’s known, can be the best cup of coffee you’ve made yet or a “works for now” method while you get your caffeine fix while enjoying the great outdoors. Who says you couldn’t be a bit healthy at camp? This cinnamon twist on granola is easy to prepare and can be eaten for breakfast and enjoyed throughout the day. Free to switch out any oils, seeds, nuts and apples based on preference and allergies! Place your cast iron skillet over a low burning fire then add the oil and swirl until melted. Add the oats and toss. After 2 minutes of roasting, add salt, cinnamon, and maple syrup. Srpinkle seeds and nuts on top. Add sliced apples into the skillet and mix. Cook for 5 minutes while stirring to evenly cook. Pizza…while camping?? Exactly. 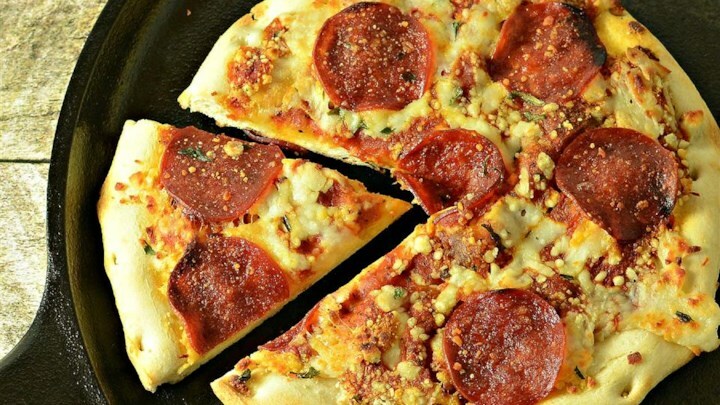 This easy to make, and kid-favorite recipe is a fun way to curb your ‘za craving and younger campers can easily join in and help. Spread/roll out the dough to desired thickness on your trusty cast iron skillet, and place above your campfire. Cook for 10 minutes until golden. Remove from the fire and evenly spread a layer of pizza sauce, leaving a 1/2 inch rim around the pizza dough bare. Sprinkle cheese (the more the merrier, in my opinion) on top of the sauce and add pepperoni slices. Cover the skillet with a foil tent and place back over the fire for about 10 minutes or until cheese has melted. Remove pizza from the pit and transfer to a plate to let cool before cutting and serving. Alright, we all know that S’mores would appear somewhere on this list. I feel like it’s a requirement. This amazing S’mores recipe gives you a twist on a classic campfire fav. 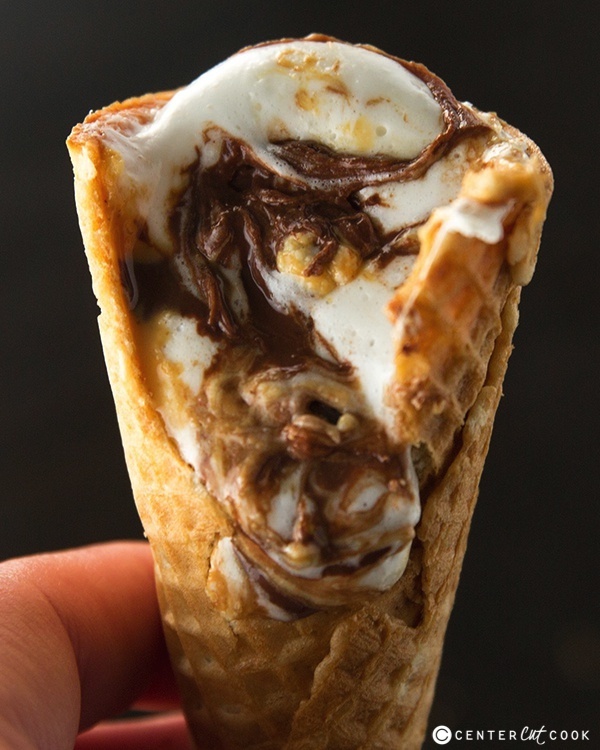 Fill up the waffle cones with chocolate chips and marshmallows. Add additional toppings – such as berries, slices bananas, peanut butter, etc. – as desired. Wrap each cone tightly with foil and place over the campfire for 3 to 5 minutes, or until the chocolate and marshmallows have melted. Carefully unwrap the foil from the cones and enjoy a sweet treat! Ready for a twist on campfire meals and want to re-create these yourself? Got your fire pit? Checkout our 6 Important Safety Tips for Fire Pit Use. Time to hit the road! Take a peek at some fun ideas on your next camping trip.